Summer struts a swagger; a flip-flopping insouciance suggesting that if it’s a hassle, why bother — as long as there’s iced tea and sandwich fixin’s in the fridge, who cares? Except when you’re shopping for produce, and recall the imports you’ll be sifting through in a few short months. Then, August’s booty cracks a whip over languor, encouraging us to shore up and use this bounty to its best advantage. I’ve a friend with a community-supported agriculture (CSA) membership, a network linking growers with consumers, who chops her weekly veggie allocation, tosses it with olive oil, and roasts the entire kit and kaboodle. She utilizes the vegetables in a variety of simple recipes throughout the week. Grilling is another easy option for vegetables — think eggplant, peppers and zucchini. This curry takes a bit more time but deliciously utilizes what Michigan farmers are bringing to outdoor markets, roadside stands and area groceries. I purchased my tomatoes, potatoes and chili peppers for the following recipe from the outdoor market at Cobblestone Farms. Vegetable additions and substitutions, such as zucchini, eggplant and peas, are encouraged. This was my first time shopping at Cobblestone Farms, which is open on Tuesdays from 4-7 p.m. in Buhr Park on Packard, and I was charmed. The bleating goats, story-telling and rows of corn provided backdrop to the pastoral tableau, with plenty of space to plop down and enjoy a Pilar’s tamale if you’re hungry. I spoke with one shopper who was thrilled to have an outdoor market in walking distance of her home on the south side of town. I purchased a loaf of Potato, Leek and Ham Sourdough Bread from Mother Loaf, and tore off hunks to munch as I browsed the tables. The architecture of this sourdough was masterful, and it took every ounce of willpower not to eat the entire loaf. You won’t find the abundance and variety of produce and Artisan goods as you would at the Kerrytown market, but you will find the best of what the season has to offer, harvested that morning from small nearby farms. This is a laid-back atmosphere with free, no-hassle parking, and an earnest, eager desire from every vendor to please. 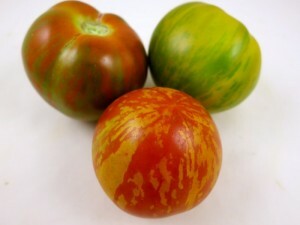 The exquisite ruby and lime striped Zebra heirloom tomatoes (also known as Tigerella) from Green Things Farms stopped me in my tracks. I was planning to purchase green tomatoes, which have an intense tart flavor so marvelous in curries, but know varietals such as this would present a distinct flavor profile, as well, lending a bit of sweet to balance the tart. 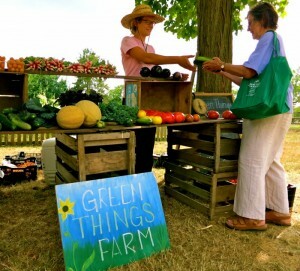 Green Things Farm is now accepting members for fall 2012. The shares will include the last summer tomatoes, beans, corn and melons, then transition to leafy greens, fall squashes and root crops. Fall shares run for 15 weeks between Sept. 6 and Dec. 13, and specific information on how to join may be found on their web site (greenthingsfarm.com). The Ann Arbor area hosts a variety of farmers markets across town, not to mention the roadside stands peppered across the landscape, but timing and location may still present a challenge to busy schedules. Local groceries also do an excellent job of stocking produce from Michigan farms. Indeed, I purchased my Michigan-grown green beans for the recipe from Hiller’s. Steamed basmati rice is the perfect canvas for soaking up the savory juices. Heat oil in a heavy-bottomed pan or Dutch oven over medium-high heat. Add the onion and cook 2-3 minutes, stirring. Add garlic, 2 teaspoons pepper, ginger, garam masala or cumin and turmeric; cook a minute, stirring. 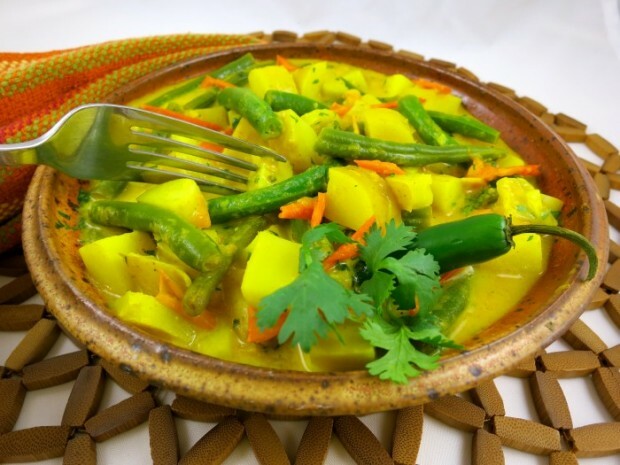 Stir in coconut milk, potatoes and green beans; bring to a boil then reduce to simmer and cook 5 minutes; stir in tomatoes and cook an additional 12-15 minutes, occasionally stirring, or until potatoes are tender. Season to taste with kosher salt and additional chili pepper to taste. Remove from heat. To thicken, with a fork or spoon mash some of the potatoes and incorporate into the curry. Stir in cilantro and serve. *When chopping hot peppers, always wear protective gloves. More Recipes Filed Under "Summer"